Be the first to know when GateSense is available for preorder! 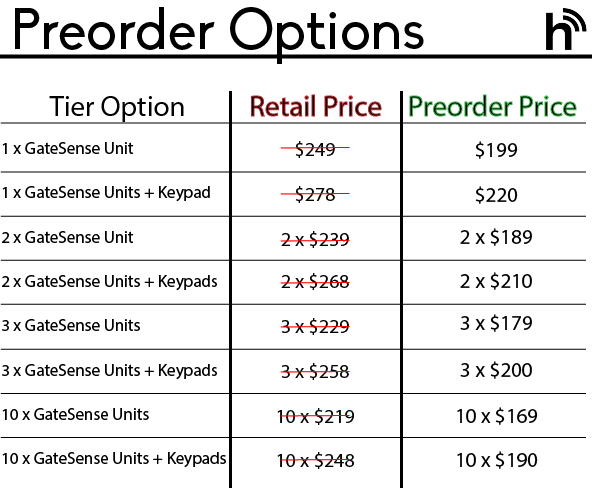 Please choose which tier you plan to purchase upon release. Who can we thank for helping you find us? Thank you! Don’t forget to share these savings with your friends. They won’t be around for long! Easily set access schedules that only allow the push button to work at desired times to keep kids, pets, or unwanted visitors out during unauthorized hours. Q: What colors will it come in? A: You can get either the Gate Unit or Keypad in solid Black or White. Q: Can I get one without a latch since I already have one? A: Sure! The unit is exactly the same but with the latch part removed. It will still be able to lock. Q: Is the keypad required? A: No, the keypad is optional and is not required to operate GateSense. Q: Will I be able to use this on my new pool build as a certified gate latch? A: Yes, we plan to get this device certified to meet the latch requirement for US swimming pool building codes.